It's Fine If My Baby Mama Hooks Up With Lil Fizz ... Just Don't Do It At The B2K Reunion!!! Hey Dumbasses ... You're Suing the Wrong Guy! Justin Bieber’s Music Is A Turn Off In the Bedroom! 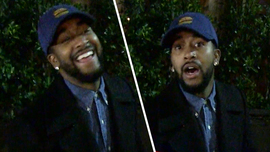 Omarion: When It Comes To Marriage Are Black Men Smarter?